Word to html conversion enables programmers and developers to create html through editing and degining word. Finally convert word to html. 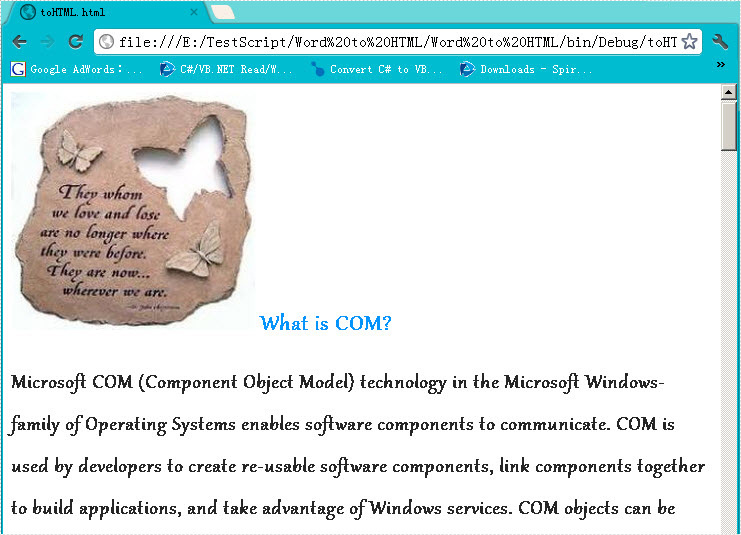 This section will introduce a solution to convert word to html via a .NET Word component with C#, VB.NET. Spire.Doc for .NET, a professional word component, without installing MS Word, enables you to convert word to html with two lines of key code. One is Document.LoadFromFile(string fileName) method which is used to load your word file from system. The other is Document.SaveToFile(string fileName, FileFormat fileFormat) that is responsible to save word as html file. Here you can view the effect of word to html conversion task. Please feel free to download Spire.Doc for .NET and view the detail code after the picture above. Spire.Doc is a Microsoft Word component, which enables users to perform a wide range of Word document processing tasks directly, such as generate, read, write and modify Word document in WPF, .NET and Silverlight.